I first heard about Spider Vomit last year when I was on tour with Love Of Diagrams. Everyone (even Bamford, if memory serves) was singing their praises. Fast forward to the end of this summer. My friend Allison tells me she has a friend from Australia visiting, and we all end up going out to Fort Tilden (the best beach in New York City, by the way). His name is Johnny and he seemed super sweet. I almost missed the ferry that day too, I was literally sprinting down from the train, and it was only the persuasion of two attractive women (Allison and Katherine) that convinced them to let me on. The ferry might cost a few bucks but it is totally worth it -- you get to see every New York City beach and if you are on one of the big ones they sell beer too. Sometime in the afternoon I discovered that he is in Spider Vomit. I wanted to get a copy of the EP off him before he left, but our paths did not cross again. However I saw Allison recently and she handed me this! Apparently he left her one to give me. It rules. "Problems" is totally a killer cut, I listened to it at least 3 times in a row the first time through. If you're ever feeling a little bummed it is an instant pick me up (but in a feel bad sort of way). I was stoked to hear Allison's voice on it too. 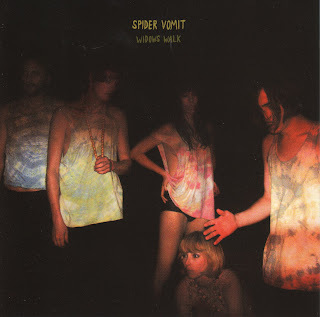 Ladies and gentlemen, for your listening pleasure, Spider Vomit.